​The museum will be open each Sunday from 2 to 4 pm. Thank you for your continued support of the Kensett Museum. The Kensett Museum Board would like to thank Lois Hogen of Northwood for the gas stove that she recently donated to the museum. 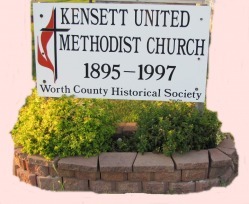 It was used on May 17 when the Worth County Historical monthly meeting was held. Three egg dishes were baked in the oven and served with muffins. The Museum was awarded a grant from the WCDA for a new furnace and air conditioning. We look forward to getting this installed. This will help preserve our artifacts. The log cabin was moved earlier to the museum site. Some repair work was done to it and a boardwalk was installed. We will have a special program later this summer featuring the log cabin. An old Kensett school jacket was recently donated to the museum. 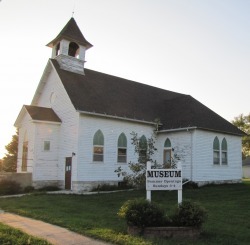 If you can think of anything that the museum could use please contact Deanna Brunsvold. The Kensett Museum Board was excited to receive the altar painting, "Jesus and Peter on the Sea of Galilee," that had been part of the former Bristol Lutheran Church, rural Joice. It was painted by Sara Kirkeberg Raugland in December, 1897. Her great-great niece, Elaine Ask, acquired the painting and had it restored. She then donated it to the museum. Arne Luckason of Kensett made a beautiful frame for it. Sunday, August 30, Elaine and her husband from Chatfield, MN., along with a relative from Belmond were special visitors to the museum. Elaine gave a presentation about Sara and the painting. There were several former Bristol members in attendance. Forty-five people came to the museum for this special program. We appreciate receiving these artifacts. We had a busy summer at the museum. We plan to have several activities at the museum next summer. Thank you for your support and interest in our local museum. Kensett Log cabin has been moved and renovated! 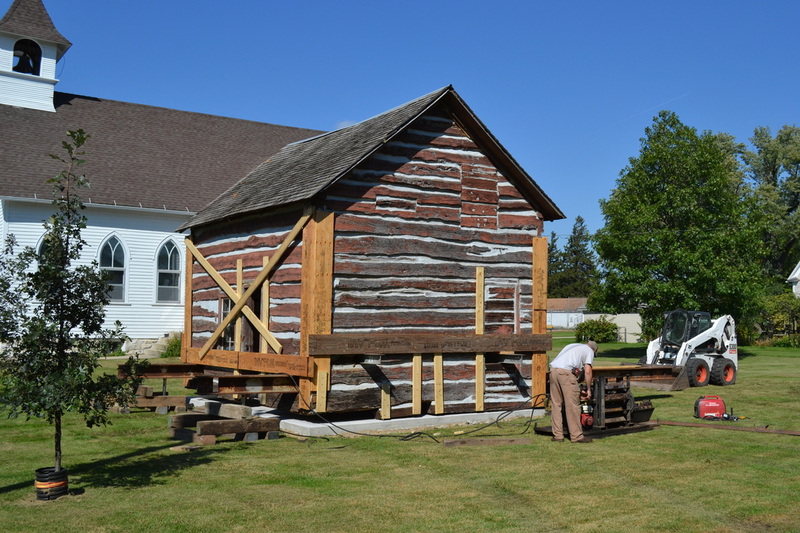 The Kensett Log Cabin museum has been moved. Be sure to click on the photo of the cabin being moved to go to the photos of the process of moving the cabin. Finished work completed on log cabin. Log Cabin at previous location next to City Garage. Setting the cabin in it's new space next to Methodist Church Museum. The Kensett Museum will be open 2 to 4 pm on Sundays during the summer. The museum has acquired a large pump organ from Betty O'Brian. We hope to use it for a future summer program. The basement has received a fresh coat of paint. There are lots of photos to look through and many items on display throughout the church. The museum will be closed June 17th due to the Worth County Fair. It will be open June 24th and everyone is welcome for pie and ice cream or a sundae. Come and join your friends and neighbors for the afternoon. The nonprofit organization is raising funds toward the restoration/rehabilitiation of the 1923 two-room school. Once completed, the lower level will serve as a community center and location to host entertaining and cultural events. The upper level will display educational and local memorabilia spanning the years 1923 to 1956. Thank you to the sponsors of the Schoolhouse fundraiser... Farmers State Bank, Kenison Construction, LM Pump Service, Larsen Plumbing & Heating, Northwood Electric, Northwood Lumber, Peterson Excavating, Spatial Designs, Spencer Movers, Universal Contractors. Art and JoAnn White of rural Bolan donated theoriginal 1923 Barton No. 2 school bell to the Bolan Schoolhouse & Cultural Center. It has been placed in the recreated bell tower, as part of the nonprofit orgainization's restoration/rehabilitation of the school.